While I plod along with the hourglass project I am beginning to consider Ann's AHIQ challenge to make a piece that includes words, so I thought I'd stick down some of my thoughts. I love words. I love to talk (and talk, and talk), I love to read, I love my dictionaries, I am pretty fond of a nice list. No surprise then, that I have already included words in some of my quilts. I have realised as I made these pieces that my interest is, specifically, in using words to add an extra layer of rhythm to what I am doing, rather than to convey any overt message. I like the challenge of including text but don't want the words themselves to distract or become the main focus. I don't know if I achieve what I am aiming for every time, but that's the general idea. This means that the ideas I have stored away fall mostly into two categories: names and descriptions. The lighthouse quilt is an example of the way names might work, and the quilt that became At the Edge was build around dictionary definitions of colour. 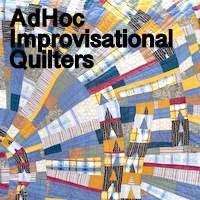 In Yellow Birds, the words I chose were intended as descriptive, but also, in the end, contributed to a quilt with quite an optimistic, upbeat feel. Of the three quilts I've done so far, however, At the Edge was the only one where I planned to include words right from the beginning; in the other two it was more a case of 'I need something extra, what can I do?' So the interesting (maybe difficult) thing for me will be to start with an idea of the words and then see what else needs to go with them. I am telling myself that if this proves to be a right royal pain in the neck I can always go back to making something and seeing what words might fit, but I'd like to start with the words if I can. I have been collecting quotes for several years. I thought about incorporating them into a quilt, but I have never gotten around to it. Now maybe the time. I have just recently found your blog. I am intrigued by the ADIC challenge this quarter. I have used words in my quilts before, most recently to try and fix an otherwie "Blah" quilt. That particular quilt still needs something more before I'll be satisfied. I hope to have something done or at least farther along to participate in the monthly show n' tell at the end of next month. I think I have been using words the same way, as another layer rather than as a specific message. And my message quilts seem to never get going. It's interesting to consider! I really love seeing stamped words in your quilts. I have never used words in quilts before, it's probably time to try that. Thanks for the inspiration! Yes, this use of words is intriguing. How do you stamp/print them? Super-love your lighthouses. Your use of words for different purposes, or none, is a great starting point. I know I will be using them as the message of my Gentrification quilt. If any of you know how to put strong black letters on a quilt, please give,me your advice. I'm thinking maybe of thread painting. Do you do that on just the flimsie or after Quilting? Any good online sources for methods would be appreciated. Good point. There is quite a difference in adding words to upgrade a quilt after the fact and starting with words from the first. I'm still wondering how to use them meaningfully myself. If nothing else, I'll add my name. But I'm struck by the variety of responses from others. Thanks. I still love your stamped words, but your words (no pun intended) strike a chord with me because I'm not sure whether to get the words settled on first, or the project! Would you be willing to share a post on HOW you create your stamped words? I'd love to try that approach . . . Thank you! Words are a striking design element, let the fun begin!